Now is a time to move forward with our new work. In order to recreate the planet in a more benevolent way for all beings it is going to be necessary to regenerate cell structure. Cell structure in the human being is, chemically speaking, functioning similarly to cell structure in other beings that we are used to seeing - domestic animals and so on. So it is not for us to change God's plan but it is for us to add something. Remember it is always easier to add something than to take something away. Plus if you try to take something away whether it be a mood, an object, a feeling, anything - it almost always causes harm but if you add something it can be benevolent. So this is what I'm going to suggest. There is an energy which is followed by a manifestation - so I'm not exactly talking about a product, I'm talking about a means and we're going to work on a means. This is how to begin. First of all I'd like you to lay down if you can, if that's comfortable. If not, sit comfortably in a chair and adapt if you can what we're doing laying down to sitting. Do not cross your arms and legs and if possible remove metal from your person. If that's not possible and the metal is normally on your person that is probably alright. Then I'd like you to request that all of the benevolent energies, guides, spirits and angels that you have with you be all around and about you to support and sustain you through this work. Then after you do that then begin by a motion with your hands. 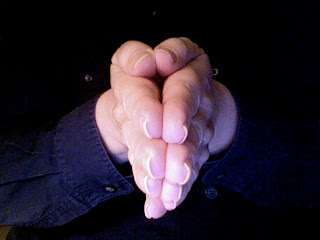 Raise your hands if you're lying down - raise them up, both hands, both arms of course - up so that they are positioned above the center of your chest - arms fully extended with your hands together in a position not unlike prayer - though have your thumbs touching your hands (see picture above). In this position, hold that for about 10 seconds. Then gradually move your arms down so that your palms are upward - move your arms down so that they are at your sides, not touching the top of your body but on either side of you. Then I'd like you to visualize a mechanism - it can be something that is in the air, on the ground. It can be something underground, it can be something from Creator. After that visualize something in the air not unlike a light forming. This visualization is not intended to be what we are trying to accomplish. It is intended to clear the way. If you would like to pray you may do so. For those of you who do not do that then you could say, "I am asking that the mechanism of all living things now be supported and added to by a new mechanism which will be available to generate the most benevolent creations that anyone might ever desire as long as those creations be benevolent for all beings." After you say that remain in that position for at least a minute. Then get up from that position and stand if you can facing the north. Move slowly in a circle - pivoting from the center as if you were standing in the middle of a compass - turn to your left and slowly covering time of about a minute - a little less or a little more is fine - make a complete circle and stop facing the north. Close your eyes for about a minute and then open your eyes and then say the following, "I request that this mechanism become a permanent portion of our spirits, our hearts and our Earth." Next time I will say more. This is the beginning and we will say and do more next time. In the beginning of this blog, those of you who read the whole thing, I promised that I would teach you many things and I will continue to do so. Soon we will be starting something entirely new but for now I'd like you to look over the blog, search it if you want to, and find all the things that you have done. Check to see if there's any further homework that you can do because I'm going to target some things in the future that are specifically meant for everybody who has done all the work. I just wanted to put you in the picture so that you'll know. If you're reading this and some of the homework seems to be missing something or the explanation is not completely thorough it's because you'll find it in previous posts. I'm not trying to exclude anybody but rather I want to help you to go as far as you can with your spiritual growth while I am here to teach - that is my intention. Now there is a situation developing I'd like you all to be alert to. In the coming days and weeks you will see developing all around you a certain level of creativity amongst people adapting to things they never thought they could adapt to before and a level of good humor will be present even amongst people that you don't think about as cheerful. I want you to know about this because it's a good sign. This is not strictly a sense of depression humor or what can we do about it humor. It is actually an increase in flexibility amongst people and the kinship and bonding effect - the friendliness effect - will spread. So I'd like you to do whatever you can to encourage this friendliness amongst people and to remind people how much they are alike. This circumstance is not an accident. I have been taught and I believe on the basis of my experience that Creator and those who assist Creator have been planing certain things for a long time and one of them is this feeling of kinship through friendliness that had not existed before. I believe you will find that things that used to cause people to be overwhelmed even a few weeks or months ago does not have that effect anymore. People will not feel as overwhelmed simply because they have learned how to ask for help. Asking for help is one of the foremost necessities of our time and it's important to be able to do it without shame and with the certainty that if somebody asked you for help that you would have something to offer on the basis of what you know, on the basis of what you can do or on the basis of your accumulated knowledge. This certainty allows you to feel much more comfortable in asking others for help. It's important to encourage this and I just wanted you to know that at this time. Time for a refresher. Do you know how benevolent magic works? I have mentioned various ways that benevolent magic works - yes but it is important to understand that while I have mentioned how true magic works here or here for example that there is more to it. The primary way true magic and even benevolent magic works on the human level, by us you understand, is that there's a strong feeling that has to do with an urgent need. It may, in the case of something personal for you yourself, be a personal need yes? It may more likely be something that is a community need - meaning your family, your neighborhood, the state you live in perhaps, the country you live in, the planet you live on - yes of course. An urgent need that you can feel - not just a thought. A thought is a thought yes? It comes, it goes - but a feeling, that urgent feeling like you might get when you are compassionate about the sufferings of others and want to do something - you know that feeling - or like you might get when a family member is in distress. You want to do something, you want to do more than you have done. It is important now to instruct you on these matters because as time goes on we will need each other more and more whether we have met, whether we know each other, whether we've ever heard of each other and to do these benevolent magic's and living prayers - to do this true magic which is all working because it is beneficial to everyone will have to be done on a basis very often where locale is not a factor. Meaning, think about it, there have been recent disasters all over the world and the people in those zones where the disasters are going on if they are able to do benevolent magic or living prayer or true magic that's great, that's wonderful but they may not be - they may be caught up in it. They may be injured and need help themselves. So we cannot sit back and say - well he'll do it, oh she'll do it. We must do what we can immediately while others are mounting rescue efforts and performing their heroic chores. We must work quietly in the background to do what we can to support and assist. Sometimes it might be a more urgent need that does not have catastrophic soundings - meaning it's not making the news. No one knows about it but you know about it and you have the urgent desire to help but there is a reason you cannot help. Perhaps you don't know the person, you don't know the family but you've heard about it - you understand. I know that most of you reading this are in service to humanity regardless of your jobs though they might also be service oriented and so it's important to remind you that one of the major ways that things occur - that there are results - if not immediately then soon or at least eventually is that you have the feeling first and then you perform the various actions as I've stated in posts here and on my other main blog about true magic and you state words that co-ordinate with the feeling. Try to follow the formulas I've given here - what to say, how to say it. Read the blogs. Remember that the labels only cover the recent year or two of this blog and so you may have to use the search box for the blog to get more information and background. Then perform these tasks as well as you can. I have spoken so much here about feelings because the physical feeling is your immediate monitor and it also activates in general, because all beings on this planet - including plants, animals - big and small, the feeling network. The feeling network is something that exists beyond individuals and always has to do with an immediate transmission and awareness. This is how you or others you may have heard of might know that something needs to be done or that there is an urgent need somewhere and may respond to that need with living prayer, benevolent magic or true magic if you know how to do it eh - and other prayers of course that you might say on your own. You know this because of the feeling network. Creator has put us on this planet I believe - to resolve things, to help to find ways to use things that exist but have no other place in the universe to be of assistance - meaning they've fallen between the cracks so to speak and they languish with nothing to do. Here on this planet, where I believe we are struggling yes but still accomplishing things that have to do with being an apprentice to Creator and other creator beings, we have the chance to put into effect that which goes beyond what we do with our hands and our minds, what we do with our ambitions and what we even do together co-operatively to bring about some benevolent and good change. Here we now have the remembrance of who we are that's coming in stronger and stronger these days which is why when we feel to do something that the feeling almost overwhelms us and it is my intention on these blogs to help guide you with what to do with that feeling or those feelings. So remember, first there is the feeling, then you might have words or thoughts that build upon the feeling, then ask for all the energies that are benevolent for you to be all around you and all about you and then perform the benevolent magic, living prayer or true magic and remember at any time when you feel the energies strongly to just pause whatever you are doing and wait until the energy fades a bit so that it is almost not there anymore and then continue because this energy that you are feeling and that includes you is activating the process that you are requesting. Remember always that this magic and this prayer is intended for only good consequences and if you make a mistake and try to activate something that is going to harm others it simply won't work and the energy will immediately disappear. This will tell you that this might be harmful to others. Reconsider it and see if you can do it in another way that's benevolent to all. There is one other occasion when you might start to do a benevolent magic, living prayer or true magic where there is absolutely no energy and you are unable to bring any energy awareness to you, for those of you especially who've been doing this for a time, and that is when you have done this before but you have forgotten. If that happens then try to use your other forms of prayer, if you wish to say something or do something or help in some other way. Chances are you've already done this but have forgotten. That happens to us all so don't be concerned if it happens to you. Remember that you can also, in the case of a benevolent magic or living prayer particularly, try to rephrase the words you were going to say and perhaps that will help even though you have done it before. I felt this refresher was needed because there are so many urgent situations happening in the world now, some of which prompted by Mother Earth for what she must do to help herself during this time of crisis for herself and I feel that if enough of us can do this work Mother Earth can do what she must do for herself but perhaps she will be able to do it in a way that is more benevolent to human beings, plants, animals and others. Lets try to be benevolent to each other because if we are going to have more responsibility for creating a benevolent society, a good world, a good place to live for all including human beings then we must take into account the needs of others as well as our own. I know you know this. Have you noticed a little phenomena lately for you. If you haven't yet, you will soon. We are easing into more integration with our light bodies. Included in this is some capacity to perceive our physical world from light bodies. Our light bodies however do not as a rule sit squarely in our physical bodies all the time, they're usually jogging around a bit. Sometimes from side to side, sometimes ranging well out of the top of our heads but always connected. You may find that you have an experience not unlike my own when I felt tall. You might find that you're working on something perhaps even in front of your computer and even though you have only swiveled in your chair - say for example and swivel back to your computer without moving your chair, your perspective of the keyboard for instance or the screen will be slightly different. If this happens move things around a bit - that's alright but also know that it has largely to do with this perception from the light body. This is ultimately going to be a very good thing because our light bodies are all from the same source. Regardless of what we wish to call it that source is associated with our universe and is co-ordinated fully with all other light sources everywhere. So many of us have asked that the world get better somehow - yes? That we have a way to communicate better somehow - yes? And that we have a means to communicate whether it be language or motion or simply by osmosis. My feeling is that this perception from our light bodies is going to be what answers the prayer of osmosis. It is just happening and I believe it is intended for us by Creator. Last time we talked about resolving issues in the past. We're going to use that same exact process - precisely as you did it before - but this time I want you to pick out a historical event - something that's happened in history. It could be your family history, it could be written history - whatever you like to choose and use that same exact process to see if you can bring about benevolent change. Sometimes history effects more people than you know. You yourself might be effected in some benevolent way as resolution is being worked on in some process. Also if more than one of you who are working with the material on this site wish to get together or even simultaneously work on this in different parts of the world that is alright. It might help but you'd be surprised what one person can do doing this. It only increases its effect slightly when you add a person. Granted if hundreds or thousands of people are doing it at the same time it does increase the magnitude of the effect but one person doing it is also very effective. So if you happen to notice some benevolent impact on your life that's fine. In the case of working with a family event that's possible but even a historical event could have some effect even though you don't understand why. Learn to trust that - not understanding why - because it has to do with the physical, the spiritual and the feeling level of all things. Even though your mind may not be able to grasp how the dots connected, so to speak, that's alright. I believe our minds are here to learn that the unseen and the unknown can be trusted if you know how to work with it in the most benevolent way. Changing the outcome of events in the past is possible. It can only be done however to make changes that you do not understand. Let me explain. In the minds of the human being - us yes - we often attempt to figure things out and we believe, very often, the facts but the facts all depend upon your position don't they - to say nothing of what you don't see. Today I'm going to suggest to you how to do something about what you don't see - how to learn to use it, trust it and use it to support your life and the lives of others. How would it be if some things in the past turned out better then they did turn out. I'm going to leave it up to you what that would be but know that this method I'm sharing with you cannot possibly be used to make things turn out bad for some people. It can only be used for things to turn out better for everyone. Still - that is possible so I want to share it. This is what to do. Try to pick out an event that is meaningful to you in your personal life even if it involves others. This way you will care about the change. Don't worry about its impact in some way that you cannot see or understand that is harmful. What I'm going to teach you here can only be benevolent in its application and outcome. Pick out that event and have a visualization if you can in the way you would like it to turn out - not necessarily all the facts and what happened one thing after another but the way you would like to have felt when whatever occurred was beginning, happening and how you felt afterwards. This is really the way much of the history that has engulfed us all in ongoing conflicts will be resolved in the present, past and future. I see no reason why you cannot start now to learn to apply it as you will be doing these things at some point and all of you have learned about many of these things between lives. So now let us begin. Again - pick an event in your own life even if it involved others and once you have taken a look at how you wanted it to start, proceed and end then focus on your feelings because when you think of this event it often distresses you - you see - and change your feelings - meaning remove yourself from the recollection of the event and settle into a comfortable feeling whether it is peace, calm, happiness - anything like that. Then as much as you can engage in that feeling look at that event - meaning from a distance - don't be in it. Just feel those good feelings and glimpse it like a snapshot from afar. Then while you stay in that feeling whatever that good feeling is say this - it won't be easy to say it while you stay in that good feeling and it will take practice but it's good to be in to practice now. Say, "Benevolent change before, during and after for me now" just once. Then continue to feel that benevolent feeling you had and when you relax completely in your body you can open your eyes. Then say, "I am asking..." you don't have to say what it is by name - that past event but say it like this, "I am asking that my past event be resolved now in feeling, in memory and in my life in the most benevolent way for me and that its outcome be at peace with others." Then again go into that benevolent feeling - that comfortable relaxed feeling that you had before as best you can. If you fall asleep for a moment don't worry about it - that's alright but when you wake up you must continue so try not to fall asleep but if you do or even if not wait a few minutes and then get up for a moment if you have been lying down flat on your back which is good but if you have been sitting or laying on either side that's alright as long as you did not have your arms or legs crossed. Then get up and find some comfortable place to stand, as comfortable as you can find, and turn one complete rotation to the left. You can keep your eyes open so you keep your balance. Then stop when you've completed that rotation and look down at your feet. Then take both of your hands and put your right palm on your solar plexus and your left palm on your heart area and say, "I am asking that this resolution bring peace, comfort and benevolence to my life now and that all memories of that past event be resolved and dissolved in my mind and body." Wait for a minute or two holding that position. Then whatever direction you need to go, turn to your left even if you need to go to your right until you get to that direction you need to go and walk slowly from that spot. Continue on with your life. This is good practice for you now and it has co-ordination with what you've learned between lives. I recommend this for you to practice on when you are able. It will help. It might take time for some of you but it will help. How will you know? Because the tension in your body - the tension level - will gradually drop. Some of you might note that certain things that you like doing - be they self-destructive or be they agitating to others might become less so because you're no longer compensating for that old wound or those old wounds if you've done this more than once for other events that you've thought about. Then you might also notice that you are interested in doing things that you've been shy to do in the past or things that you have had no interest in doing before. That's all we'll do today but we'll build on this in the future - you and I together. Goodlife. Quite a few years ago when I was still living in Sedona, Arizona I was driving home late one night down a two lane blacktop road there. I lived a little ways out of Sedona proper and I remember there wasn't a single other car on the road - I hadn't seen one. That was unusual. I saw on the road...something ahead. I couldn't make it out. I started slowing down and then as I got closer I realized what it was. There were frogs everywhere on the road. It was almost biblical except that they weren't falling from the sky. They were just sitting, every one of them sitting quietly on the road. I was still going at such a rate of speed I couldn't stop and I very carefully eased my way through there hoping that I hadn't struck any of them. Of course I wanted to turn around and go back and see if they were alright as I am fond - yes very fond of animals but I got strongly that it was important to keep going. So I said a living prayer and a blessing for their safety. The next day first thing, I drove up to the area to see - worried that there would be dozens of injured or dead frogs all over the road. Small though it was, it is a highway. Much to my relief and amazement there were no dead frogs or signs of frogs there at all. I remember how quiet they were which is not typical for frogs and the odd thing is that there was no water around there so they would have had to migrate a ways to get there. My friend Sandra, around that time in that part of the world, told me that she had had an odd experience a day or two before I had had mine. She had been down by Red Rock Crossing and she had heard the frogs making strange sounds. She was born and raised in that part of the world and she had never heard frogs making sounds like that. She was very concerned because she knew that frogs have everything to do with water and inviting water and when you're living in a desert area, even high desert, water is very important. I can't tell you what was the outcome. I never really found out one way or the other but putting together what Sandra told me and my experience of seeing these little beings on the road I said many living prayers and did many blessings that Sedona and the environs would have all the water that the land and people needed. Greetings, today I would like to share an experience I had not long ago. I've had this experience before and I believe I may have shared it with you here but this happened recently. I remember I was standing down in the lobby of the building where I live and I was in an area where the mailboxes are, standing behind a narrow wall looking at the bulletin board and the announcements there. The next thing that happened was that I heard a young woman gasp and I turned to look at her and I saw at that moment what I thought was an unusually small person and then I looked again and I realized my point of view was at a much higher level - meaning taller then I would normally be focused on - I was seeing things from high up. I then realized that that thing had happened again where I was very tall. The woman had at that point walked around behind me to her mailbox, and I remembered I made a small joke to ease the tension and she laughed, and curiously enough at that point I was eye to eye with her from my perception and I was no longer so tall. The difference this time as compared to last time is that she saw me at that height physically whereas the last time the man saw me in my normal height but with a ray of light above my head even though I saw him as if I were in that perception of being very tall. I do not claim to know what this is all about but it is a phenomena I have only experienced on rare occasions. The interesting thing this time as I say, is that she saw me at that height and while she was startled she did not scream and run away so it was not such a horrible sight. Still I am hopeful she has settled with the experience and has chalked it up to simply an unusual phenomena. She seemed to be alright when I left and we had chuckled once again and that was that. Wouldn't it be wonderful if every time someone saw something that was strange and unusual about a person that they might gasp inwardly or outwardly perhaps but that would be it and that with a simple joke the situation would be defused and everyone would feel alright with each other. I grant that this is a hope not necessarily a reality but it would be a nice thing.